Finally the question, “Where does he get those wonderful toys?” has been answered: Mattel. The good thing is you won’t need to be a billionaire with your own secret research division at Wayne Enterprises to get your hands on these versions. How do they compare with their onscreen counterparts? Well, the Bat-Pod matches up in its simplest form and then takes a few liberties with the vehicle seen in The Dark Knight Rises. In a case of give and take, it is missing the kind of tires that make 90-degree turns possible but it adds in an extra piece that can be clipped on. That provides armour and a big piece of firepower and while the weapon isn’t strictly canon, it is strictly a cannon. 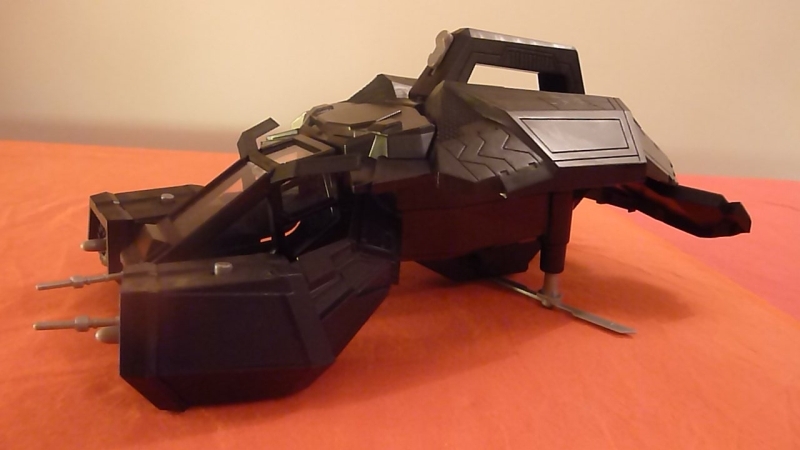 Once built the Bat-Pod motorcycle has a nice, easy motion as it is pushed along the ground. Decent force in the cannon should also be able to knock over any Bane figure you stand in the way. As for the figure that comes with it, both the scowl and the cowl look pretty good for a tiny man who is going to spend most of his time hidden away like the world’s most paranoid TT racer. Batman’s latest toy takes the Caped Crusader to, ahem, new heights as Christopher Nolan’s crime fighter gets a much needed lift [Stop it – Ed] in his fight against Bane. However, The Bat would have been so much more impressive if Mattel had made its two rotor blades turn using battery power rather than having them momentarily spin when given a flick. That would have been particularly welcome when using the handle to swoop around the room and dish out justice with your two front missiles. The figure that comes with The Bat has to do a spot of flying himself so he is not quite as detailed as the one riding the Bat-Pod. Nice winged flying action when he springs from his concealed inner compartment, though. The Dark Knight Rises Toys from Mattel (with a little bit of licencing help from DC Comics) are available now. 90-degree turnsBaneBat-PodBatmanbattery powerbillionairecannoncanonCaped CrusaderChristopher NolancowlDark Knight Rises ToysDC ComicsflyingMattelmotorcyclescowlThe BatThe Bat-PodThe Dark Knight RisesTT racerWayne EnterprisesWhere does he get those wonderful toys?